Quantise audio like a pro with Logic's Flex Time. Flex Time is an amazing tool for quantising your audio with the kind of nuances of swing and feel that are more usually associated with MIDI quantising. Flex Time is Logic's interpretation of elastic audio, making it painless to adjust the tempo and rhythm of audio tracks, whether the timing of a beat or the phrasing and musical inflection of a vocal track. It's not hard to use, but it can take a little practice and experimentation to get the results you're after, let alone to take full advantage of this highly creative suite of tools. Flex Time falls into the category of 'easy when you know how'. To get started, click on the Hide/Show Flex View tool icon in the toolbar. With Flex View enabled, you'll see the Flex Mode pop-up menu inside the track header of each audio track in the track list. The default view is 'Off'. Select from the pop-up menu the Flex mode — or algorithm — appropriate for the task at hand. Once you select a Flex mode, transients are detected on that track and visible as grey lines in the waveform. You are now ready to quantise and Flex! Keep in mind that Flex is enabled per track and not per individual region, so if it's a lengthy song it may take a minute for Logic to detect the transients. The transients are audio peaks, often representing the initial peak of the attack phase, in your waveform. Choose from several different Flex Modes for your track. The Flex markers are the vertical orange lines with little handles at the top. These are the edit points that can be dragged forwards and backwards in time to expand or compress the audio that came before and change your musical phrasing. Specifically, Flex markers determine the boundaries of your Flex edits. The visual feedback is fantastic. Colour-coding helps you see at a glance what portions of the audio are being affected and how. Green indicates time compression and red reveals any time expansion. Colour-coded Flex markers let you see at a glance whether a section has been time-compressed (green) or time-expanded (red). To add a new Flex marker, click in the upper half of the waveform and a Flex marker is created at the clicked position. Moving a Flex marker to the left time-compresses the preceding audio material. Moving it to the right will time-expand the audio material from the preceding Flex marker up to the moved marker. Just play with it a few times and it will all make sense. Flex markers can be dragged either at the white line over the waveform or on the orange handle above. To delete a Flex marker, double-click on it. A very cool feature is that Flex editing is non-destructive, so you can disable — sort of bypass — your Flex edits for an individual region at any time in the region parameter box. Flex editing is non-destructive. You can enable or disable Flex Time for each individual region if you want to, making it very easy to analyse the effect it's having on your audio. Once transients are detected on a track, the same quantise menu that's available to MIDI in the region parameter box is now available to audio. Select the quantise value and swing percentage, as you would for a MIDI file and experiment with your groove. 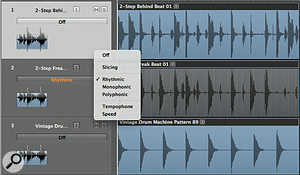 Group-select Flexed tracks to assign them the same quantise value and tighten the feel. Try straight 16th and a swing, such as 16c swing, or even an 8th-note swing, such as 8E. Once transients have been detected, the same quantise menu is available for audio as is available for MIDI. This is fun. After a track has been Flexed, control-click on the region header in the Arrange workspace — the thin area at the top of the region where the region name is located — to access the Slice at Transient Markers feature. Once you've sliced on the transients, there are infinite possibilities for editing out unwanted pieces of the region by muting or cutting between transients. The possibilities are as much creative as corrective. Mute or delete between transients to strip the groove, or perhaps build the 'B' section or a breakdown by slicing and muting not just on a drum loop but into a horn, synth or other music sample. You can easily change the tempo of a vocal track or your entire project by simply Flexing it first. Enable Flex View in the toolbar then chose a mode to detect transients on all your tracks. Now change the tempo in the Logic transport and all the tracks will conform to the new tempo. Note that it's best to perform the transient detection on the track(s) with the Logic tempo set to the original tempo of the audio file(s). You can perform transient detection on all tracks at once. Create a group encompassing all tracks, then select a Flex mode on any track. Transients will be detected for your entire project at once. Then change the tempo in the transport for an efficient global tempo change. For beats, Slicing or Rhythmic mode is recommended. The unique attributes of the Slicing, Tempophone and Speed Flex Modes can impose really cool effects on your beat in the right situation. All of the Flex algorithms have subtle but distinct different uses, and my best advice is to experiment. In the Instrument Parameter Box (below the Region Parameter box) in the middle of the Inspector, there are parameters you can adjust for each Flex Mode. Slicing mode allows you to Flex edit without applying time compression or expansion to the original audio. It's perfect for drum tracks or any track where you want to preserve the original attack, release, and length of the performance. As the name suggests, this mode slices the audio without any time-stretching and just moves the slices around as needed. Select Slice Mode from the Flex Mode pop-up menu on the audio track that contains your bear. Set the Slice Length in the Instrument Parameter Box to 56 percent. Try the same steps on a few beats placed in a group with the Editing parameter enabled in Group Parameters. Rhythmic mode is well designed for rhythmic guitars, keyboard riffs and Apple Loops. Monophonic mode is great for any solo vocals, or monophonic instruments playing melody and bass lines. Polyphonic mode time-stretches material and requires more processing power than the others. It delivers high sonic quality for complex material, such as full mixes. This is recommended if you have a mix (maybe an MP3 or WAV file) of a song you want to Flex and then change the project tempo of, as we did earlier. Tempophone mode creates a mechanical sound with many artifacts when you stretch the audio by dragging apart the transients by the Flex markers. It's designed for creative and rhythmic special affects. Take a beat, add a few Flex markers and move them around to introduce some time-stretching and time-compression. Not only does your audio speed up and slow down according to the Flex markers, it also gains pitch effects that almost give a drum and bass feel, but a little glitchier. There's one more creative Flex mode to experiment with: Speed mode. This mode time-stretches material by playing the source audio faster or slower. Because of the pitch-shifting involved, this Flex mode is primarily useful for percussive, unpitched material, but it can be used on other material for dramatic effects. If you've installed all the Apple Loops content, try it with 'Slapstick Cartoon Short', which is a whole piece of cinematic music. Flex it, then slow it down a lot, maybe out to Bar 21, by option-dragging the lower right-hand corner. If Speed Flex wasn't enabled, option-dragging would still slow it down, but it probably wouldn't be as smooth. Listen to the audio against a drum beat, and then without the Flex edit, by temporarily disabling Flex Time in the Region Parameter Box. Now try one more, this time 'Farewell' from the iLife Sound Effects. Perform the Speed Flex, then drag the beat out to about bar 33. These different Flex modes are well worth experimenting with, for both practical editing purposes and the production of interesting effects. While Logic came late to the elastic audio game, it makes up for that with its comprehensive and creative implementation of the concept.